I have been lending in peer-to-peer lending networks like Lending Club and Prosper for a few years now. I believe that peer-to-peer lending networks are gaining credibility; especially with the successful Lending Club SEC registration in 2008. In 2008, I made +8.73% with Lending Club and + 7.58% with Prosper, which was decent returns considering the economic condition. That’s it. 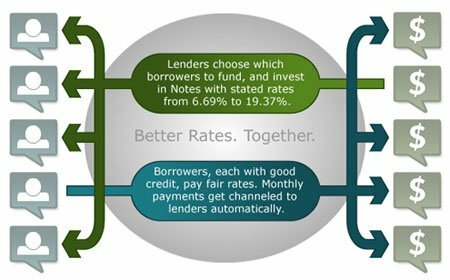 For a first time lender, I suggest using the LendingMatch tool to invest $25 in a loan in the lowest risk category. The process for Prosper is just as easy, so I won’t be covering it here. In case you’re not familiar with peer-to-peer lending, these networks bring together a large number of lenders and borrowers. As a lender, you have the option of lending as little as $25 to a borrower. If you have a large sum of money to invest, you can spread it out over multiple borrowers (or loans) or you can invest more money in each loan (not recommended). As a borrower, you can borrow as much as $35,000 and this amount can come from one lender (unlikely) or multiple lenders. Here’s a nice image from Lending Club’s How Social Lending Works page. However, I must warn you that peer-to-peer lending is not without risks. When I started, I was enticed by the higher interest rates on higher risk loans (i.e., borrowers have poor credit ratings). This worked out fine initially, but I am starting to see late loans and defaults. For example, I had two defaults in my Lending Club account that amount to $45.38, which effectively wiped out my gain resulting in a -1.88% loss in 2008. I fared slightly better with Prosper, where I had three late loans, but no default. Except for one loan, all of these late and default loans are subprime rated loans. So my advice is: Stick to prime rated loans, if you want to start investing in peer-to-peer lending networks. Lending to borrowers with good credit will not eliminate credit risk, but it will great reduce that chance of losing your money due to defaults. Reviewed and updated on March 20, 2011. No discussion about peer to peer lending can seem to escape the question of risk and defaults. Now that you’ve been invested in the two networks for over 3 years I would be curious to see how your default rate has changed. Any updates? @Shelby – the past years has been slightly positive return (better than bank interest rate, but not that much better). There were 1-2 chargeoffs a year, but not big. Overall, the return is positive. However, I have been putting my money toward other investments, e.g., we just bought a rental property last month. I think it’s a good way to diversify your investments if you already have your core investments in place. Hello. I would like information on P to P lenders, who are interested in mortgage loans. This is the situation. I have a home improvement business. I purchase ONE house a year to renovate and sell. The most I have ever paid for one of these properties is $180,000. The longest that I have ever had one is 1-1/2 years. I hate dealing with mortgage companies, because they want things to be fixed before loan approval, but if I am going to gut and renovate a house, why should I replace a worn bathroom floor, BEFORE I buy the house? I am offering 8% APR, amortized for 30 years, but will only need it for 2-3 years tops, and it is secured by the real estate itself. I have a 700+ credit score. I would appreciate any information anyone can give. I’ve just completed a new website called PeerLendingWealth.com which provides a road map for creating an ultra low risk approach to peer lending, while providing returns of 10-14% per year. The opportunity has arisen by disintermediating the banks, and keeping the profit they typically make for yourself. To date, most peer lending has been haphazard as the books and blogs written on the topic completely miss the opportunity. By following these proven techniques, anybody can exceed 10% per year without risking principal. The methods are banking methods – create a broadly diversified portfolio of loans to very low risk people, knowing that a small percentage will default. By having a broadly diversified portfolio, the few defaults that do happen are simply part of the plan, and still enable investors to earn over 10%. The site features analysis and simple charts of statistical probabilities of expected returns and the predictability of default levels, all based on techniques that I have used to successfully to earn an average annual return of over 13%. PeerLendingWealth.com takes out the mystery and uncertainty of peer-to-peer lending. LOL what a waste of time at these rates, you are giving your money away. You are lending out money to unsecured borrowers at rates reserved for prime and known borrowers. Your local bank would never lend below 9% (best rates) for a personal loan to the most credit worthy borrowers, why are you lending at rates below that? You’re chasing 3-4% above CD rates and adding so much risk. You’re better off buying high yielding stocks who won’t cut their dividend, a Verizon for example paying 6%. Bob there are NO stocks that might not cut their dividend…J.P. Morgan cut their dividend from 38 cents to 5 cents for the first time in 30 years. I think one point Pinyo missed (I am sure he covered it in another review) is that the venture into p2p lending is not correlated to the market. techically isn’t a default on a loan is an investment loss to the lender? and if so, can this be recovered through tax forms? @BLD – Yes, default would be considered an investment loss that can be deducted for tax purpose. The caution for new person to person lenders is never to take the interest rate at the face value because defaults can lower the overall performance or even put you in the negative. Okay, I will definitely wait for that default risk article before doing anything. @Chiko – Give it a try. But just like any other investments, make sure you understand the risks so that you can properly decide. I am planning to write about default risk when making person to person loans — hopefully, some time later this week. @Dan – Prosper and Lending Club should be compared to bonds as opposed to stocks. And they are probably more like junk bonds than anything else. @Curt – Default risk is definitely a concern and I am planning to explain the issue to my readers. But remember, every investment comes with its own set of risks. @Bernz – May be you want to wait for my default risk article before making your next move. I have been a Prosper member for over a year now but never really did get into the business of lending money. I signed up with the purpose of becoming a lender to received a better return for my money but just could not pull the trigger just yet. Have heard both positive and negative results but lately have been inclined to really going for it now as there seems to be no place out there where your money can actually make a decent return without any risk involved anyway. I’ve got friends who are averaging over 10% with P TO P lending, but you are absolutly correct, there is risk and there is fraud out there. Great advice to go in to it with your eyes open. I think the recession is about to kill the market. As the recession deepens, the defaults will increase – just like they are with credit cards. Cash out while you can. I used Prosper.com for a while in 2007, 2008. It was going well until we entered an unprecedented recession! I’m still at a slight positive at .35% estimated ROI through lendingstats. I guess in hindsight, much better than a 40% wallop in the market. Any thoughts on differences/benefits over Prosper? I think I am going to add this to my building wealth activity. I think I like lending club better though. I’ve done quite well with Prosper. I am hoping to be able to reinvest in them once their SEC filing is done. I have 3 loans, all are current. @Sam – I only have about $1,200 invested in the two networks. I am only adding what I can afford to lose. @Brett – Good point about borrowers with lower loan value. My defaults are also higher value ones. Lending Club has been a little bit better. I believe they have higher credit score requirements to begin with. I had $2875 invested in 87 loans. Those are about a year old and only two have defaulted so far, so I think my return is positive there, but have never calculated it. I was also fortunate to have earned a free $268.75 on lending club, which has helped to balance out the losses at Prosper. I agree with you that you need to stick to the higher credit grades. I prefer to lend on loans of lower total value. Also, I recommend new lenders learn what the different fields mean to help you evaluate the credit information. Don’t just learn that inquiries means that the person pulled credit to be evaluated for a loan, but that a high number of credit inquiries may mean they person is loading up on debt, other lenders are denying loans to the person, or it might mean desperation for money. Several bloggers gave me some more p2p lending advice when I first started lending. How much have you deposited into these? I put in 2k and have stopped adding more since I got a few defaults. I never calculated my return. Sounds like you did really well. Maybe I will re-evaluate mine later.